(1) The Office Hymn is an integral part of the Western Divine Office. The Office loses something of its integrity without it. (2) Just singing any old hymn in the Office doesn't make it an Office Hymn. There is a place in Christian devotion for 'affectionate' hymns - I rather like Fr Faber's, for example. But the old Office Hymns are sober, elegant, dignified, biblical, patristic, corporate rather than personal, in the old tradition of the Roman Rite. (3) If you can't say/sing them in Latin, the best English translations are those by the Anglican Catholic Fr J M Neale (a lot of which you will find in the English Hymnal: not the New English Hymnal which may have excellences but makes no attempt to provide a full set of Office Hymns). I say this, not simply out of loyalty to one of the great, heroic, persecuted figures of Catholic Anglican history, but for a precise and historical reason. (4) What Neale translated was the text of the hymns in the old English Sarum Office Book. And that text was pretty well the same as the original text. It was also identical to the text in the Breviary of that magnificent pontiff, Pius V. BUT in the 1630s, Urban VIII, who loved the pagan Roman poets, had these ancient Christian texts mutilated so that they would look like something by Horace in metre, grammar, and vocabulary. They stayed like this until Vatican II, in one of its wise decisions, ordered that the ancient original texts, only lightly revised, should be restored to use. 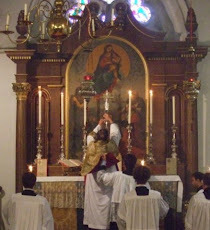 This was accordingly done in the post-conciliar Liturgia Horarum. So Neale's translations are closer both to the originals and to what the Western Church now orders than are the translations made in the nineteenth century by RC translators. Sometimes people ask what the Anglican Patrimony is. And there is sometimes an assumption that it is something largely irrelevant to many people ... Choral Evensong, for example. I believe it is something that can contribute to the mending and the wholeness of the entire Latin Church. A few weeks ago I had occasion to be with 60/70 priests who were saying/singing the Office together. They, each of them, had the English version of the Liturgia Horarum before them; I have never wasted good drinking money procuring this publication. As I followed the Office in my Latin LH I was surprised to find that the the hymn they were using was quite simply not the one in the Latin Editio Typica (neither were the preces). One simple ingredient I, personally, would insert into any preliminary set of liturgical regulations for an Ordinariate would be the facultas to use the Office Hymns provided in the English Hymnal in connection with the vernacular LH. Actually, come to think about it: the LH Preces are that part of the revised Office which has worn least well. Some of them positively reek of the Sixties. Would there be a problem about an Ordinariate allowing the Prayer Book Preces to be used optionally? The Instructio Generalis Paragraph 184 already permits local hierarchies to allow alternative forms of the Preces; one would just have to add to Dr Cranmer's Suffrages a petition for the Departed at Vespers. Why should we need to be allowed to use the BCP Office (with Office hymn, naturally)? Those who wish will just go on using it. You certainly don't need to be allowed to do that. A priest I know in America, who used the Liturgia Horarum as an Anglican, reverted to the BCP when his parish joined the Anglican Use! What I suggested related to what is permitted with the Liturgia Horarum. Would this produce too great a jarring sensation between the base vernacular of the modern Roman books and the hieratic English used by both J.M. Neale and the B.C.P. preces? One solution, for those who have unwisely spent their drinking funds on the English-language LotH (and I assure you, the US version is much worse than the UK version), is to use (at least in the US version) the preces from the Appendix; there are 7 sets, one for each day of the week, and are the sort of short, to-the-point prayers that are traditional in the Roman Rite. Steve is right, the US version LoTH is much worse than the E&W version of the Divine Office. About the best one can do, for the US version, is to obtain the Mundelein Psalter, which unfortunately is only Morning Prayer, Evening Prayer and (you should pardon the expression) Night Prayer. Saint Pius X. published in an Appendix to the Antiphonale Romanum in 1912 the older hymns from the Breviarium Romanum of Pius V.
I like your solution. Those shorter forms can be found in the Latin edition too, Appendix II. Unfortunately, they are only for Vespers, so you are out of luck for Lauds. I believe the Liturgy of the Hours American edition in fact does use some of JM Neale's translations. So while many of the hymns in that are pretty bad, not all are. So when you refer to 'Office Hymns" you mean particular ones from Sarum Usage? Is there a Latin/English Office Hymn book that can be referenced? Never having been a regular Office devotee this is all new to me. I once calculated that 25% of the intercessions in The Divine Office (the non-US English version of the Liturgia Horarum) are not even loose translations nor paraphrases of the Latin. I am told that the seminarians at the English College in Rome were employed to devise these - a tale so barmy it's probably true. "Let us ask the Father, from whom every family in heaven and on earth takes its name, to send the Spirit of his Son into our hearts as we pray: R/. Lord, in your mercy, hear our prayer. Pretty obvious, isn't it? The three central petitions are a light revision of the Collect for All Conditions of Men, composed by Bp Gunning for the 1662 BCP. You tell me that some naughty ex-Anglican student at the Beda didn't slip that one through to the keeper. Oops, I meant the Venerabile. As a Romish lay person with limited skills in the Latin language, I have used Morning Prayer/Lauds from the Divine Office for many years (too many for me to admit to, given my age). What I started doing a few months ago was using the Latin hymns from my copy of the Liturgia Horarum (owned for just one or two years less than the length of time referred to above but not used much) because I had got fed up with those in the Divine Office. And, more recently, I have started using it for the Preces. So, of a morning, I swap to and fro between the two. The LOTH is a horrible office anyway-Latin or not though the English translation (American at least) is horrid, especially in "hymns". Many are the same garbage that you would find in the disposable missalettes popular in U.S. parishes today. I use a'64 Benzinger totum in absolutely horrible shape (the cover is basically electrical tape...) with the actual hymns in translation for most Offices I say (the others I use the Pius XII Latin breviary, its not good, but I'm poor so I make due). This book (albeit rare, unfortunately) is much better than any LOTH book out there. Although I have spent not a little time on liturgics, I must confess I am completely ignorant of office hymns. I wish to remedy that. Does Fr. Hunwicke or learned readers have suggestions for sources to read to reduce my ignorance? Fr. Hunwicke and I see eye to eye quite consistently and nearly perfectly. The ordinariate must formally and officially encourage the use of the a pre-1962 divine office book in english, such as is found on breviary.net, renwick's english sarum office or (benedictine) monastic diurnal by canon douglas. If the ordinariate can not allow a pre-1962 divine office in english, it will be a failure.